By: Enric Escorsa O’Callaghan, IALE Tecnologia, S.L. The world’s population is rapidly aging - according to the World Health Organization (WHO), in almost every country, the proportion of people aged over 60 years is growing faster than any other age group. Within 35 years, there will be more people alive older than 60, than there are people younger than 15. Tony Trippe of Patinformatics LLC is writing an excellent series of technical blog posts discussing patent clustering, visualization and especially classification. Part 1 of the projected three part series describes the difference between clustering and classification. The most popular technical approaches are discussed. The market for medical devices is growing and open to new innovative companies. We use CLAIMS Direct and KMX to look closely at surgical devices and see that patent activity tracks the market trend towards minimally invasive surgery. By: Elicet Cruz PhD., Iale Tecnologia S.L. MADISON, Conn., Jan. 10, 2013 — IFI CLAIMS®Patent Services, the leading producer of global patent databases, analytic solutions and innovative web services, has compiled the following facts from its analysis of calendar year 2012 U.S. Patent and Trademark Office (USPTO) data. The USPTO issued 253,155 utility patents in 2012, the highest annual number on record and an increase of approximately 13 percent over 2011. IFI CLAIMS licenses the CLAIMS® Global patent database to Gridlogics, an India-based intellectual properties solutions provider with customers all over the world. Under the agreement, IFI CLAIMS global data will be accessible from the Gridlogics PatSeer™ patent search and analysis platform, giving its customers access to high quality, integrated patent data. The Cooperative Patent Classification (CPC) is a new patent classification system developed jointly by the United States Patent and Trade Mark Office (USPTO) and the European Patent Office (EPO). CPC will be launched in January 2013 and will replace national patent classifications currently used at the EPO (ECLA and ICO) and at the USPTO (USPC) after a transition period. Below you can find some useful information on the implementation of CPC in IFI CLAIMS Global Patent Database. Fractus is a Spanish fractal antenna manufacturer, spin off from the Polytechnic University of Catalonia (UPC), that licenses its technology to leading manufacturers of wireless devices primarily related to consumer electronics, such as mobile phones. The following is a guest blog contributed by Enric Escorsa of IALE Tecnologia. In 2006 Fuji Photo Film Co., Ltd. entered into the cosmetics sector by launching a series of new antiaging products. Surely for some it was shocking to see how a company operating for decades in the photography industry had moved now into a completely different sector such as the healthcare one. In this post we try to understand the diversification process followed by the Japanese company by using IFI CLAIMS Direct patent database and KMX Software. IFI CLAIMS provides a large collection of Chinese patent data through its CLAIMS Direct web service. We have 5,988,582 Chinese patent translations with English language description and claims. This data is produced using a sophisticated statistical machine translation engine. We train the engine using patent data resulting in an accurate translation of a broad technical vocabulary. CLAIMS Direct is not an end-user tool. Instead, it is the developer friendly web service that software engineers and system integrators can use to easily expose patent search and patent data in their applications. The patent API provides access to unequaled performance, data coverage and data quality. A new post from a guest blogger - Enric Escorsa of Iale. Enriq writes about innovations in shale oil extraction with emphasis on the change of ownership of Argentina Oil Firm YPF in "Repsol, YPF and the pursuit of unconventional oil". In April this year, Argentina’s president, Cristina Fernández, announced her decision to seize control over Yacimientos Petroliferos Fiscales (YPF), the former Argentine oil firm that since 1999 had been part of the Spanish oil company, REPSOL, under the joint name of REPSOL YPF. What is “cloud computing”? Is it a technology, a business model, industry hype? In the popular press, one can easily find many different definitions and opinions. IFI CLAIMS®Patent Services, the leading producer of global patent databases, analytic solutions and innovative web services, today announced the top-50 patent law firms ranked by most U.S. patents granted to clients in 2011. Oblon, Spivak, McClelland, Maier & Neustadt led the list with 5,613 followed by Sughrue Mion with 3,389, and Birch, Stewart, Kolasch & Birch came in third with 3,020. The yin yang between patent quantity and quality has long been an issue among innovative businesses. It has yet to be resolved. It is not a simple matter of those with a lot of patents must have more questionable ones, but high numbers do tend to beg the question: which patents are really important and to whom? In addition to claims, factors like industry, timing, need and perception play an even increasing role in patent quality and value. – Bruce Berman, a principal in Brody Berman Associates, an IP communications firm that advises patent holders and managers and helps to position IP assets. Facebook is planning an IPO next month. It will be one of the largest IPO’s in history. Thanks to everyone who joined our "KMX for Portfolio Analysis" webinars. For those who were not able to attend, we invite you to check our schedule and join us at one of our future events when we will continue to explore the patent analytics, text mining, visualization, and the potential of our CLAIMS DIRECT patent web services – the developer-friendly patent data API. One of the most common uses of IFI CLAIMS Patent Intelligence and Technology (PITR) is to provide quick reports outlining patent portfolios. These snapshots provide a convenient summary of patent activity across a technology or a set of patent assignees. Often the first step in an analysis, PITR lets you drill into the numbers, view five- or ten-year trends, and easily collect a summary report that provides a high-level overview of major patent portfolios. Here we look at the top university portfolios and their US granted patents received between 2007-2011. Why does it take so long to get a patent? The time lag between when a patent application is filed and when the patent is granted currently averages 33.7 months or 2.8 years. To many inventors, that seems like a long time. California leads the nation in innovation, or does it? On January 10, 2012 IFI CLAIMS Patent Services released its ranking of top global companies based on US utility patents in 2011. Our IFI analysts work closely with our customers providing them with access to high quality patent data that allows them to develop deep insights into corporate patent portfolios, technology landscapes, and competitive intelligence. While preparing our 2011 Patent Intelligence and Technology Report, we took a closer look at the 2011 US patent grants and in particular the location of the inventors named on these documents. Despite the obvious surge of Japanese, Korean, and Chinese companies in the Top 50 assignees, 50% of US patents in 2011 named US inventors down only 4% when compared with 2001. Patents with Japanese inventors are the second largest group accounting for 20% of US patents in 2011 which is basically the same as 2001. Germany comes in third although dropped from 9% in 2001 to 6% in 2011. Chinese inventors appear in less than 2% of 2011, but this presence has grown by more than 1000% when compared with 2001. 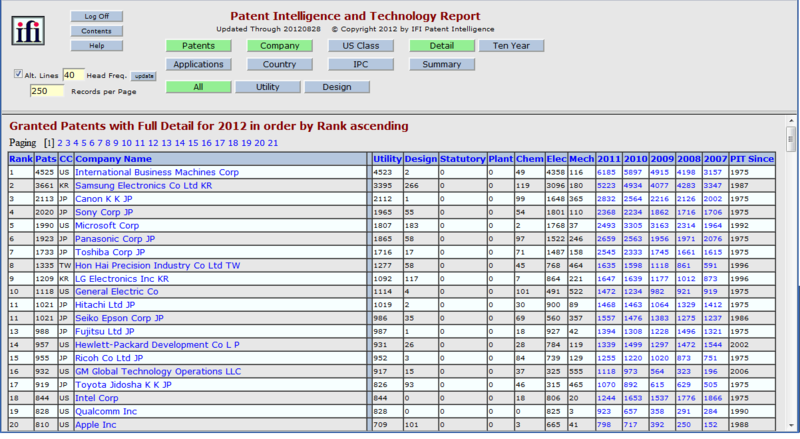 On January 10, IFI released its annual Top 50 Patent rankings for 2011. This report is a summary of information available through IFI’s Patent Information & Technology Report (PITR) product. PITR provides high level summaries of patent trends for the companies receiving the most US patents over the last 10 years. Over 3,500 companies are covered. You might be surprised at how deep the data in PITR goes. You can drill down to actual patent numbers by US or IPC patent class. But what if you want to drill down further than that? IFI’s KMX patent analytics solution can expose the subject matter of the patents, and allow you to apply your own classification scheme to them. MADISON, Conn., Jan. 11, 2012 — IFI CLAIMS®Patent Services, the leading producer of global patent databases, analytic solutions and innovative web services, today announced its top-50 ranking of global companies awarded the most U.S. utility patents in 2011. IFI uses proprietary algorithms and 50 years' experience analyzing U.S. Patent and Trademark Office (USPTO) data to compile the de facto annual ranking. Utility patents are the most common patent type and a primary means of protecting intellectual property and technological innovation. Linguamatics, a leader in enterprise text mining, today announced that it has agreed to license patent content from Fairview Research's Alexandria database. Linguamatics has acquired a developer license as part of its ongoing strategy to provide more effective patent mining solutions to its customers. Fairview Research's Alexandria database contains 85 million patent records from over 70 countries. Alexandria includes data from the U.S. Patent Office (USPTO), the European Patent Office (EPO) and the World Intellectual Property Organization (WIPO).